Peabody Champions managers Steve Gridley offers advice while Mike Giardi (right) takes a turn at bat during a North Shore Baseball League game. DANVERS — At first glance, Mike Giardi and Steve Gridley are unlikely leaders of a baseball dynasty. By day, the 42-year-old Giardi is a math teacher at Marblehead High School and Gridley, 43, coaches youth basketball and baseball. By night, the two friends are managers of the aptly named Peabody Champions of the North Shore Baseball League, a winning team built on a shared love of the game. 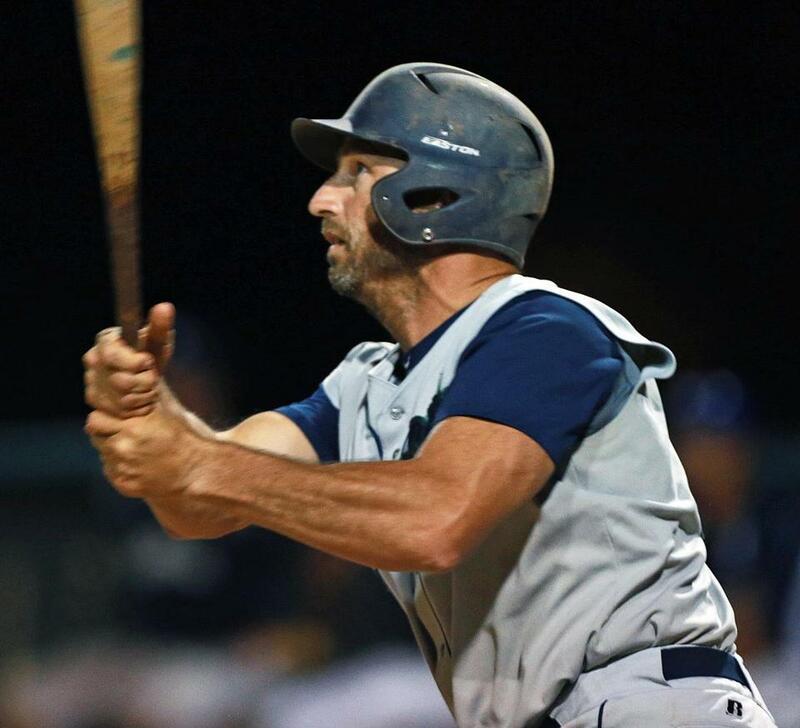 Since they started managing together in 2001, Giardi and Gridley have led the Peabody Champions to seven North Shore Baseball League titles and 10 appearances overall in the championship series. The 12-team league plays a 24-game regular season schedule, starting in late May. 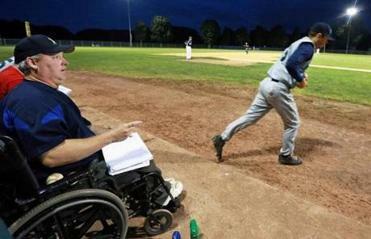 In Game 5 of the finals last Thursday night at Twilight Field, the two managers could be found side by side, as they often are during games — Giardi on the bench and Gridley, who is a paraplegic, in his wheelchair. Giardi, who also suits up for the team as a utility player, raised a question about his last at-bat. “Was that a good pitch to hit?” he asked. It was the sort of candor that typifies their friendship. Giardi and Gridley became buddies in 1991, when Gridley was looking for a summer team to play on when he wasn’t playing college baseball at Salem State. “After my first year of college, I was playing Senior Babe Ruth and that ran out,” Gridley said. He had heard about the North Shore Baseball League a year before, while working at Champions Pub in Peabody, which sponsors the squad. He joined the Salem Lonnies the next summer and became friends with Giardi, who at the time was a two-sport standout at Harvard, a quarterback for Joe Restic, and the Ivy League Player of the Year (1994) on the diamond. Giardi went on to play minor league baseball (Yankees, Giants, and Expos) for four years before returning to the North Shore League in 1999. The Harvard graduate said that once he started playing for the Champions, he found a new love for the game and began to appreciate everything it has given him. While Giardi was playing professional baseball, Gridley’s life took a completely different course. In February 1998, he was diagnosed with a spinal tumor and soon became paralyzed. At first, Gridley stayed away from the baseball field because he wasn’t comfortable with his new look. After two years away from the game, Gridley was convinced by Giardi to come back to coach youth baseball in 2000 and help coach the Peabody Champions in 2001. Thirteen years and seven championships later, the duo is still leading the Peabody Champions, a team of players ranging in age from 20 to 43. “I think we set the tone that we’re going to have fun,” Gridley said. Mark Shorey, 30, played seven seasons in the St. Louis Cardinals organization, advancing to Triple A, the top rung in the minors. Now in his second season with the Champions, the Peabody native said that he continues to play for the team because he loves the atmosphere and the friendships he’s made. Cameron Couillard, in his first year with the Champions, said that learning from players like Shorey and Giardi has been an incredible experience. There was no championship for the Champions this year, but they were close. The Kingston Night Owls prevailed, 7-2, in Game 7, on Saturday. Giardi, Gridley, and the rest of the Champions vow the loss won’t keep them from continuing to be a part of the game they love. “Until they literally take the cleats away, and if I can still go out there and compete, I’m going to try to do it,” Giardi said. Isaac Chipps can be reached at isaac.chipps@globe.com.